Bellows are an important tool when it comes to cooking with charcoal. Charcoal’s temperature, unlike firewood, is regulated more by how much air it has, rather than how much charcoal is on the pile. 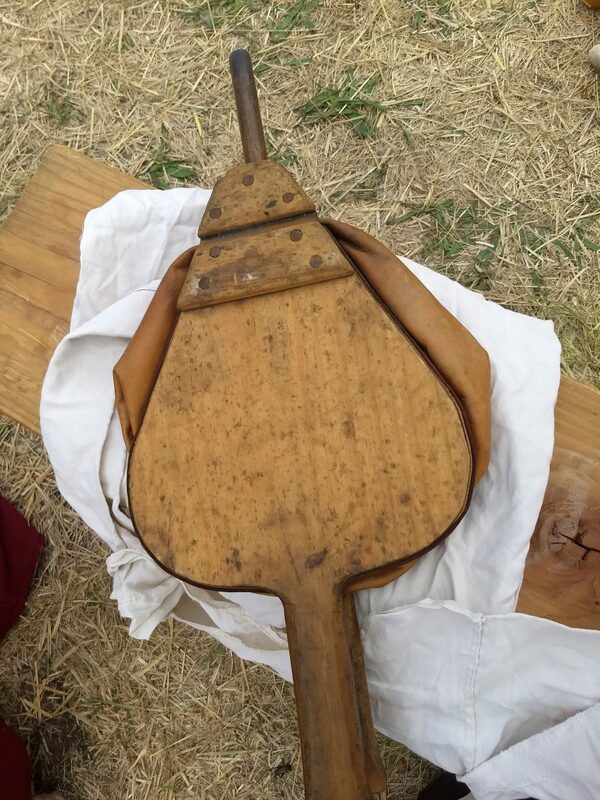 However, there are a few tricks to using a bellows, which are not widely known by the average re-enctor. 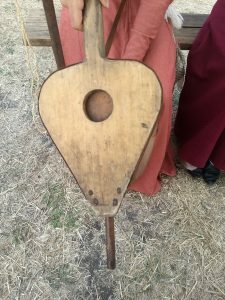 Staple’s bellows are based on a pretty simple design. We looked at various manuscript images of bellows (most of which can be found here http://www.larsdatter.com/bellows.htm) but in particular, http://visualiseur.bnf.fr/ConsulterElementNum?O=IFN-8100286&E=JPEG&Deb=81&Fin=81&Param=C Three men tortured in a furnace, The lives of Saints, 1377. The bellows themselves were constructed from seasoned pine board, 12mm (correction, 19mm. we wanted to plane it down to 12mm but didn’t have the woodworking skills at the time) which we picked up from that most discerning of wood suppliers – Bunnings. A hole was made via an auger in one, and were joined together by nailing leather to the sides. A copper tube was glued into the front. The hole (intake valve) is always pointed straight down. The valve works by gravity, so it works best when the hole is on the bottom. Never place the copper tube directly into the coals. The most effective place is about 10cm away from the charcoal. Pump the bellows in a long, slow, gentle, consistent motion. It’s not about pumping air as quickly as you can (it won’t work and you’ll tire yourself out for no reason), it’s about consistent, constant air movement. 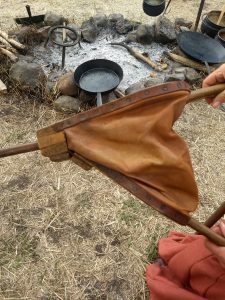 Do not leave the bellows out in the dew overnight – this can result in mold on the leather. The bellows can be “tuned”. If where you are pumping the bellows is resulting in ash flying up, by changing the angle of the bellows and the distance, you will get a spot where the ash doesn’t rise when the air is pumped.